Clean Carfax, 1-Owner, LOW MILEAGE 4WD, Fully Serviced, Immaculate Inside and Out. 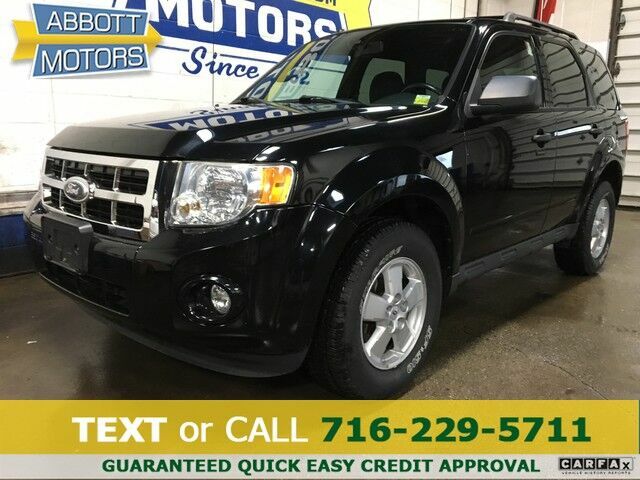 ABBOTT MOTORS, An exceptional car buying Experience, is offering this exceptional Tuxedo Black 2010 Ford Escape XLT 4WD w/Low Miles for sale. CALL or TEXT (716) 229-5711 for quick answers to your questions about this vehicle. Your message will be answered by a real human never an automation. We stock only the highest quality vehicles which have undergone a full safety inspection, fresh oil change, professional detail and Carfax Guarantee. All vehicles come with a Written Warranty and Extended Warranties are also available. CARFAX BuyBack Guarantee is reassurance that any major issues with this vehicle will show on CARFAX report. Enjoy a higher level of satisfaction with a CARFAX one-owner vehicle. The Ford Escape is the benchmark all other SUVs strive to meet. With exceptional power, towing and handling, this SUV can handle anything thrown at it. This 4WD-equipped vehicle will handle beautifully on any terrain and in any weather condition your may find yourself in. The benefits of driving a 4 wheel drive vehicle, such as this Ford Escape XLT 4WD w/Low Miles, include superior acceleration, improved steering, and increased traction and stability. The Escape XLT 4WD w/Low Miles has been lightly driven and there is little to no wear and tear on this vehicle. The care taken on this gently used vehicle is reflective of the 47,467mi put on this Ford. Beautiful exterior. Clean interior. This Ford Escape is so immaculate it is practically new. This 2010 Ford Escape XLT 4WD w/Low Miles is not like every other automobile. The Ford was equipped with many of the added features that make this vehicle such a unique automobile to own and drive. The tires on this exceptional vehicle have minimal wear and look to be nearly new. This Ford Escape XLT 4WD w/Low Miles has a showroom quality finish with no dents or scratches visible. This Ford is equipped with some of the most amazing wheels the market has to offer! Once you take this Ford Escape XLT 4WD w/Low Miles for a test drive, you'll instantly realize how much of an added bonus this vehicle's upgraded wheels provide. More information about the 2010 Ford Escape: The 2010 Ford Escape is one of the most affordable and economical small SUVs, and its car-like ride and handling, along with good maneuverability, make it a solid choice for urban drivers. The Escape is a Top Safety Pick award winner from the Insurance Institute for Highway Safety and has received a five-star government rating in all crash tests. Mileage is estimated at 22 mpg city/ 28 mpg highway. MSRP starts at $20,515. At the same time, the Hybrid model is one of the lowest-priced hybrids and offers a practical way to "go green." The 2010 Escape Hybrid offers a fuel efficiency of 34 mpg city/ 31 mpg highway. MSRP for the base hybrid starts at $29,750. Interesting features of this model are fuel efficiency across the lineup, competitive pricing, hybrid available, an eco-friendly vehicle inside and out, and Smooth ride and handling ABBOTT MOTORS has over 50 years of automotive experience! We are also a CARFAX Advantage Dealer specializing in outstanding customer service and satisfaction! We offer FINANCING FOR EVERYONE...ALL CREDIT APPS ACCEPTED. We look forward to helping you purchase your next vehicle. Apply Online 24/7 at Abbottmotors.com ... All Trade-ins Welcome... Same Day Delivery... Call or Text Today and See The Difference... We Look Forward to Serving You!! This vehicle may be subject to potential open recall(s). Vehicle recall information may be found at Safecar.gov. Please verify price, equipment, options and features with your sales rep before your purchase. We Look Forward to Serving You. *Tax, title, plates extra. All Financing On Approved Credit. We are a BBB accredited member.